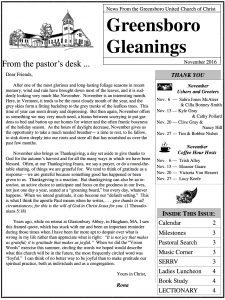 The “Greensboro Gleanings”-newsletter for November is now online. Rona has penned a thoughtful note about the meaning of Thanksgiving and a reflection on the transition of seasons as winter approaches. Ushers, greeters and coffee hour hosts are listed for the month; so, double-check to see if you are ‘on-call’ to help serve in these functions. This issue also includes an update on the pastoral search committees efforts in finding a permanent pastor for the church. Please also find information about upcoming music, outreach and events (including the annual SERRV sale and the Ladies’ Christmas Luncheon). As usual, take note as you please to the November birthdays in our congregation. Dates and topics for upcoming lectionary readings and the Advent Book Study group are also noted. Have a happy and contemplative November!